Student Style Spotlight: Tyler Goode on the Higher Standards of His Uniform | Grand Central Magazine | Your Campus. Your Story. It’s an unmistakable pattern that Tyler Goode struts to his ROTC courses in the Finch Fieldhouse. 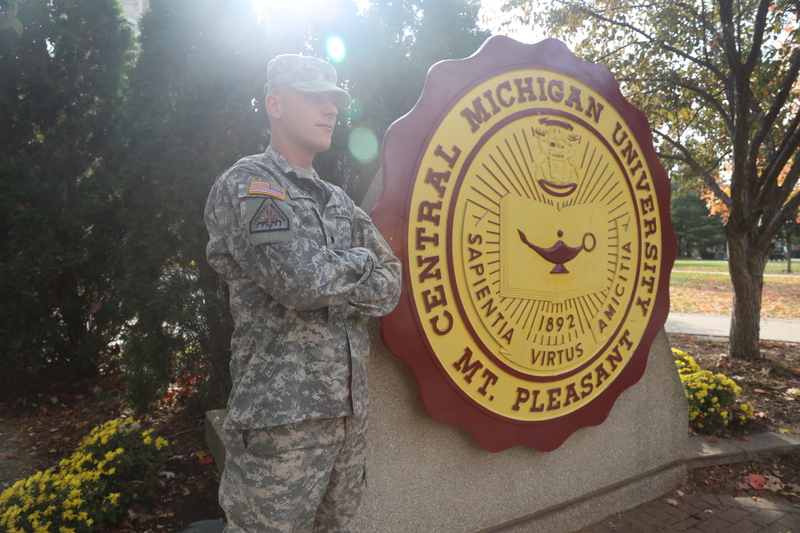 A CMU junior and finance major, Goode holds himself to a higher standard when in his U.S. Army uniform. Goode says he enlisted when he was just 17. His basic training was in South Carolina, where he stayed there for six months. He came back to Michigan after that, and decided to come to Central after two and a half years of being enlisted. 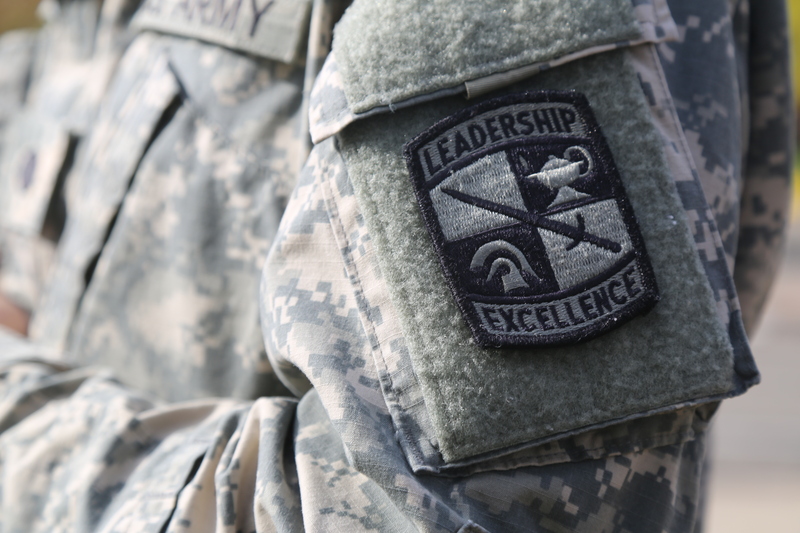 ROTC students like Goode wear patches on their uniform. On the center of his chest and on top of his hat, a single black dot represents “cadet,” which is what the students are. “We have a joke that it’s a ‘ca-dot’, that we’re all ‘ca-dots’,” Goode said, while laughing. An American flag lies on the side of his right arm, though it’s backwards. 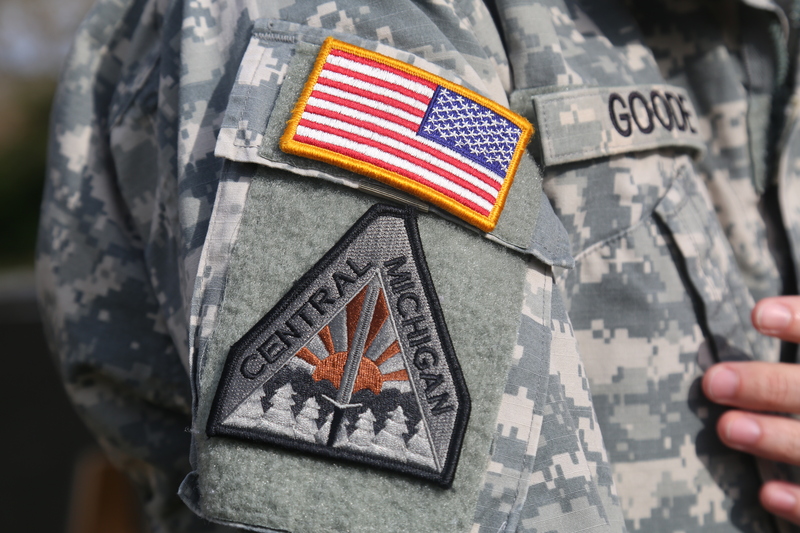 A Central Michigan University patch is also part of the uniform, representing the designation of where the ROTC student is. Goode’s last name rests on his left side of his chest, and “army” is on his heart. Though the uniform looks like it may take longer to put it on, it takes Goode a total of five minutes to get ready. Goode says there are many rules to wearing a uniform and how to behave while in it. A service member has to wear their hat while outside, and take it off once they’re inside. Goode says you will never see a military member wearing a hat inside, unless they are loaded – otherwise known as “hot”. Other rules include no walking and talking on the phone, no earbuds and no hands in pockets. Goode says the rules add up and can seem tedious at times. Goode feels good when people thank him, though he has never been deployed. He says he knows how service members were treated after Vietnam, and never wants that to happen again, so he takes every compliment with a smile. “If I’m just hanging out with my buddies, obviously I want to be more easy going, so I would just wear jeans and hoodie, or whatever I’m wearing for the day. If I have to go class I want to dress a little bit nicer – dress to impress they always say,” Goode said. He likes to shop at North Face, Eddie Bauer and Columbia. Goode describes his personal style as professional, but he likes to be outdoors and incorporate that into his everyday look. When Goode has ROTC class, he has to attend his other classes that day in his uniform. Goode says he sometimes catches himself using barring when off-duty. Though the army and his ROTC officers hold Goode to a high standard, he holds himself to a higher one, and he doesn’t take his uniform for granted. Next time you see Goode on campus, whether in uniform or not, thank him for being a part of our nation’s army and buy the man a black coffee. Separator image Posted in Men's Style, Style, Style & Beauty and tagged with Anne Langan, army, cmu rotc, Devon Rademacher, men's style, north face, ROTC, tyler goode, uniform, US army.